← A (Belated) Happy New Year! WARNING: THIS POST CONTAINS SPOILERS FOR THE FIRST SEASON OF STRANGER THINGS! IF YOU’VE NOT WATCHED, DO THE RIGHT THING AND GET THEE TO NETFLIX! If you follow me anywhere on social media, you know that I’ve been freaking out about Stranger Things since July. It was definitely my favorite show from 2016. I am a somewhat passive football fan, so the highlight for me during the Super Bowl was the Stranger Things trailer. I’ve been waiting with bated breath for any news of the next season, particularly a release date. I got my wish! If you’ve not seen it yourself, here’s the trailer. Here are my initial thoughts and breakdown of the trailer. Eleven is back! I think we all knew she would be. The first time I watched the show, I thought she had snuffed it, but was then skeptical at Hopper’s visit to the woods in the final episode. On a recent rewatch, I happened to notice that a hole started opening up in the demogorgon as she was sending him back to the Upside Down. I had initially thought she blew him up and went along with him. I’m quite happy to be wrong about that. 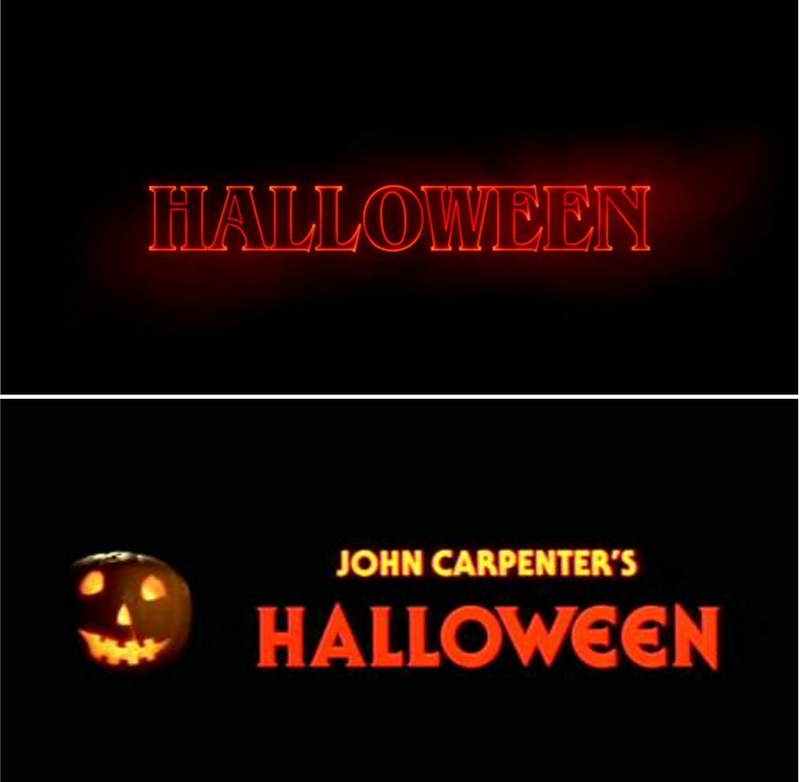 It takes place during Halloween week 1984. The teaser image of the boys, minus Will in Ghostbusters garb signals that this is post-June 1984. Also, if you look closely, you can spot the date on the surveillance TVs. Are they at Hawkins lab? I’m certain that’s Will on the table. In addition, I can’t imagine a scenario other than Halloween as an accepted reason to wear Ghostbusters get-up to school. Will the Wise can see things. One of the more disturbing images in the trailer is the juxtaposition of the monster drawing and Will crying. I believe the drawing to be by Will because of all the other artwork he drew in the first season. This makes me think that Will has definitely not left the Upside Down unscathed. At first, I was unsure if the boy crying was Mike or Will, but juxtaposing the image with the drawing inclines me to believe it’s Will. Of course, we knew that he was still burping up slugs and getting flashes of the Upside Down, but it looks to me like he may be deeply psychologically connected to that realm as well. I’ve thought for a while that Will may have powers, since he’s the only one to survive the Upside Down. My personal theory is that he and Eleven are the two metaphorical heads of an actual D&D demogorgon, which is not the Tuliphead monster we see in the first season. Will is the deception head; Eleven is destruction. Will is good at hiding, after all. I think he’s slowly starting to realize that while he’s no longer physically in the Upside Down, he is not out of danger yet. Thessalhydra, Demogorgon, or Demogorgonzilla? The final shot we get in the trailer is of some huge monstrous nightmare fuel that is about to lay waste to Hawkins. This of course is the very same monster in the drawing I mentioned previously. 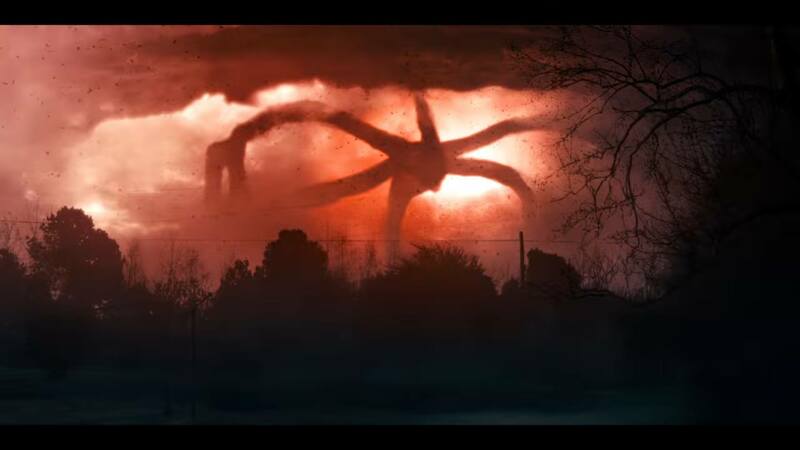 My initial thought was that the Demogorgon (or Alien) nest in the Upside Down has hatched and created an IT inspired monster, inviting Hawkins to look into its obscenely over-sized deadlights. My second thought was, “No! This is DEMOGORGONZILLA!” I also just enjoy saying Demogorgonzilla. After conversations with a friend on facebook and reading this article, I’m now leaning that this might be a thessalhydra. 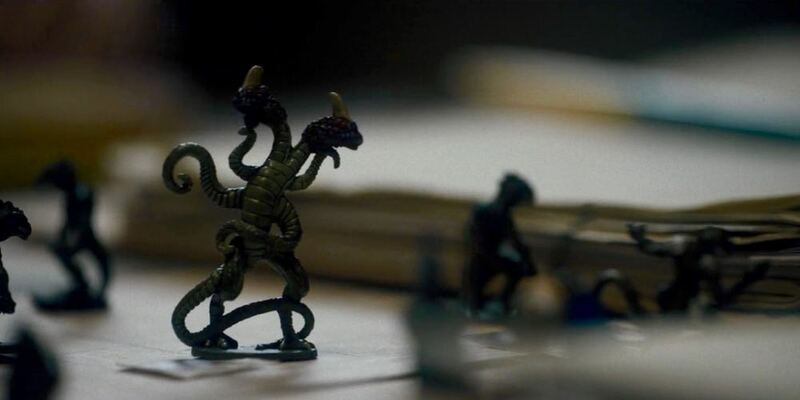 If you’ll recall, in the final episode of season 1, the boys are fighting a thessalhydra in their D&D game. Wikipedia describes a thessalhydra as, “It resembles a hydra for the most part, with a few differences. Instead of its eight heads emerging straight from the reptilian body, they form a ring around a large, circular mouth rimmed with jagged teeth. The tail ends in a set of pincers that can grab an opponent and force it into the large mouth. The main mouth can spit out a gob of acidic saliva once every day.” That sounds an awful lot like the monster we see standing over Hawkins. It’s also important to note that Mike says Lucas only cut off 7 heads. Thessalhydras have eight. This realization terrifies me. I’m so eager and fearful to see what will happen! “The Lost Brother.” A few months back, we got episode titles for season 2. I wasn’t sure what to make of any of them then, though I was certainly intrigued. The final episode is entitled, “The Lost Brother.” Now with my knowledge of the 2 headed demogorgon, and the new trailer, I can’t help but think of Halloween 2. Is Will the lost brother? Does he have a lost brother? Is he Eleven’s lost brother? I feel like I’m shooting in the dark with this, but this image really makes me think that we’ll see more John Carpenter in the coming season. I have a lot more thoughts about Stranger Things. If you want to talk with me about them, leave a comment! There’s also a great discussion about the trailer and season 2 going on in the facebook group, Retroist Clubhouse. The speculation period is almost as fun for me as the actual act of watching the show. What do you think will happen? What are you most looking forward to in Season 2? This entry was posted in TV and tagged Netflix, Stranger Things, Stranger Things Season 2. Bookmark the permalink. Couldn’t be more psyched for season 2! Great review!